The world is witness to a rapid increase in the number of people forced to flee from wars, conflict, and persecution in countries such as Syria, Iraq, and Afghanistan. It is estimated that approximately half of the 19.5 million registered refugees at a global level are children and youth. They are the most vulnerable victims of these conflicts. As a result of the fall in immunization rates—from 99 percent before the war to less than 50 percent now—polio has reemerged in Syria, after a 14-year absence. At the same time, doctors report an increase in the number and severity of cases of measles, pneumonia, and diarrhea. In response to the polio outbreak, UNICEF, the World Health Organization (WHO), and health ministries in the region have launched the largest immunization campaign in the region’s history, targeting more than 25 million children. Many times, militants bomb health care facilities, wait for first-responders and emergency crews to come in and then strike again, thus maximizing the impact of their attacks. On April 27, 2016, the Al Quds field hospital in Aleppo was hit by an airstrike. It killed 30 people, including 2 health workers, and injured 60 people, completely destroying the facility. An estimated 37,000 children have been born as refugees and over 83,000 Syrian pregnant women are living as refugees in Lebanon and Jordan, placing a heavy burden on those countries health and social systems. For example, Lebanon is planning for 600,000 schoolchildren this year—twice the number currently enrolled. 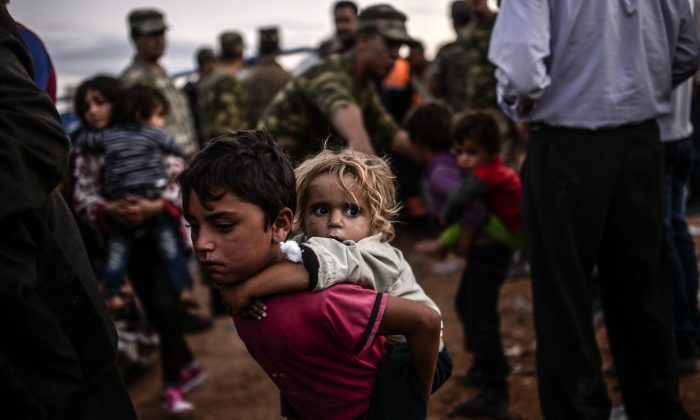 The Post-Traumatic Stress Disorder (PTSD) rate among Syrian refugee children is comparable to that observed among other children who experienced war. A study by the Migration Policy Institute shows that refugee children who are not formally educated are more likely to feel marginalized and hopeless, making them probable targets for radicalization.